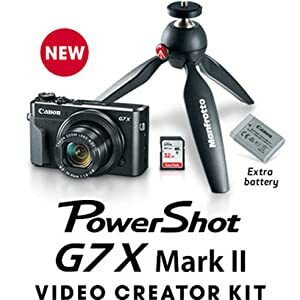 The PowerShot G7 X Mark II Video Creator Kit gives you the tools to capture impressive and rock steady video you can later view, edit and share. 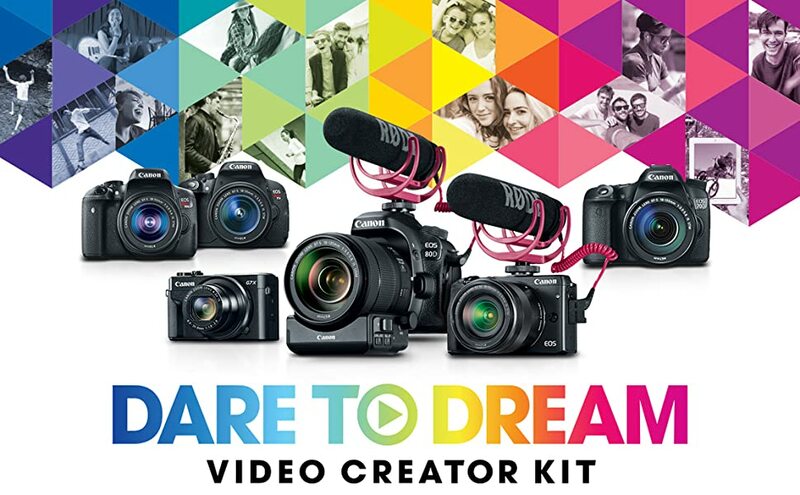 Whether for video blogging, shooting a short film or simply recording the sights and sounds that inspire you, you’ll have everything you need in this one kit. 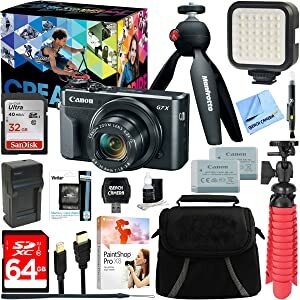 Featuring the compact PowerShot G7 X Mark II camera and its abundant feature set, including a 1.0-inch sensor and 3.0-inch flip screen (perfect for selfies and more), this Video Creator Kit version comes with a lightweight, portable Manfrotto PIXI MINI Tripod to stabilize your shots plus a SanDisk 32GB SD Card and extra NB-13L battery pack so you’re always fully equipped to record when that planned and even unplanned moment arises. Stay inspired with the PowerShot G7 X Mark II camera, which combines exhilarating speed and performance with a smart, compact design. It can be ideal for travel, events and anywhere on the go, or as a secondary camera, and features a high-performance 1.0-inch 20.1 Megapixel CMOS sensor as well as a bright f/1.8-2.8 lens to help capture impressive images whenever your creativity sparks, even in low light conditions. The new DIGIC 7 Image Processor immediately pays dividends with improved auto focus tracking, enhanced IS and superb image clarity even when shooting with a high ISO. For increased flexibility, the PowerShot G7 X Mark II offers high-speed continuous shooting up to 8 fps in RAW, JPEG and RAW+JPEG modes, and is equipped with Full HD capability, built-in Wi-Fi and NFC and in-camera RAW conversion, giving you everything you need to capture inspiring images and video and share them with ease. The PowerShot G7 X Mark II camera features a large 1.0-inch, 20.1 Megapixel CMOS sensor that helps capture high-quality images and videos. Its wide dynamic range helps ensure both bright and dark parts of an image are fully captured, like the shadowy side of a building on a bright sunny day, or streetlights on a dark night. 20.1 Megapixels means photos with enough detail to print, or enjoy on high-resolution monitors and mobile devices. It also gives additional flexibility during editing, giving you the option of cropping in on your subject for improved composition while still having a detailed, high-resolution image. Smooth gradations from light to dark keeps unrealistic banding in solid colors to a minimum. Thanks to an available ISO of up to 12800 (expandable to 25600) and the power of the new DIGIC 7 Image Processor, extremely low-light photos and videos are possible, with minimal image noise. Using a high ISO also allows for a faster shutter speed, which lowers the possibility of blur caused by excessive hand-held camera shake. For added flexibility, both JPEG and RAW images can be captured and saved. The remarkable lens on the PowerShot G7 X Mark II camera takes full advantage of the camera’s large sensor, giving your photography a wide range of expression. With a bright aperture value of f/1.8 at the wide angle and f/2.8 when fully zoomed to a factor of 4.2x (24–100mm), this lens not only puts more in your frame, but is equipped to capture an incredible variety of situations with artistry and precision. Equipped with a 9-blade iris diaphragm, the lens lets you achieve a beautiful background defocus with shapes that are nearly round. Capture macro shots from as close as 2.0 in. (telephoto at 1.3 ft.). 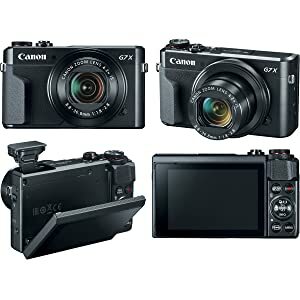 From a design perspective, each of the 11 glass lenses on the PowerShot G7 X Mark II has a multi-layer coating on it, which is similar to the Super Spectra Coating technology developed by Canon for EF lenses. These coatings have features like a high transmission factor, ultraviolet protection, resistant surface hardness, and stable characteristics. The coating also maximizes suppression of unwanted reflected light from ghosting or flaring to deliver clear images with high image quality. Built-in Wi-Fi technology allows for on-the-go convenience when you want to share your photos and videos with friends and family. 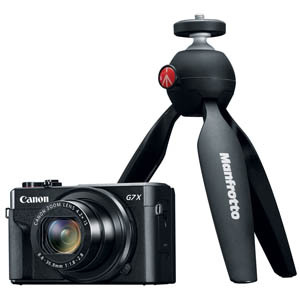 Easily post your images to select social networking and media sites – Facebook, Twitter, YouTube, Flickr, and Google Drive – through CANON iMAGE GATEWAY directly from your PowerShot G7 X Mark II camera, or save them to the online photo album to share anytime, anywhere. 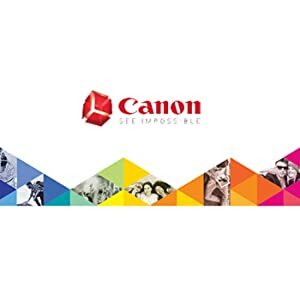 The camera can also connect directly to both compatible iOS and Android devices, and upload images via the free Canon Camera Connect app without a computer. You can control the destination of your uploads to share with everyone or to select groups, and even add comments. Sharing video is also easy with Wi-Fi equipped PowerShot cameras, which record video using the easy-to-share MP4 format. Wi-Fi capability makes posting in real time possible, so you can keep everyone up to date with photos and video even as events unfold. Wi-Fi technology also allows you to transfer images to other Wi-Fi equipped PowerShot cameras or print your photos directly to a PictBridge (Wireless LAN) certified printer. Thanks to the newly added Wi-Fi Button, you can now connect in both Shooting mode and Playback mode for quick and easy operation. You can even turn on the camera and connect at the same time with just one press of the button, helping you get right to sharing and managing your files when you like. PowerShot digital cameras with built-in NFC (Near Field Communication) technology provide fast connectivity with a single tap. Simply touch the NFC icon on your camera to your compatible Android device, and the Camera Connect app will launch automatically for quick, easy sharing of your images. Built-in NFC technology also makes it simpler to install the app. If the app hasn’t been installed yet, once you touch the devices together for the first time, the download screen will display automatically. Simply touch the camera against an NFC-equipped device with the Canon Camera Connect app installed, and a Wi-Fi connection is established – no camera operations required. Even if your camera is off, NFC turns the camera on and establishes the connection (confirming the camera’s nickname and privacy settings before the first connection is required). At Beach Camera we pride ourselves on providing the best Point & Shoot Camera Bundles at the best prices. All of the items we include in our bundles are brand new and of the highest quality. They provide you with everything you will need to take your photo game to the next level. As an Authorized Dealer all camera’s purchased from us come sealed in their original box and includes Full Manufacturer Provided Protection.